Do you need to do the HRIPT Test? Consumers allergic reactions to topical products applied to the skin surface are increasingly frequent in our industrialized world. Whether they are real allergic reactions or simple irritation, the intensity of the emotion experienced by the affected consumer is proportionally related to the size of the adverse reaction. I am covered with rashes … I made an allergenic reaction with your day cream. What should I do? What can you do for me!? Do you have sensitive skin or are you subject to allergies? Are you sure that the reaction is due to our product application? A simple phone call from a consumer and a long process begins: stress and long minutes (and sometimes hours …) of search for the responsible department such as R&D, formulation or marketing teams. A process of paperwork is launched to document corrective and preventive measures, and to submit the required reports to regulatory authorities. Going out to meet consumer expectations seems to be a guarantee of quality and tranquility for these companies. Help your business to obtain and to retain customers who not only want efficient products but also products that will not produce potential skin irritation reaction. Don’t launch on the market formulations that may be irritating ! Meet consumer expectations by offering improved products with truthful, objective claims, based on reliable evidence. How to start? Launch on the market hypoallergenic formulas (creams, gels, serums …) after conducting a clinical study called the HRIPT or RIPT test (Human Repeat Insult Patch Test). The HRIPT testing is an Skin Test Allergy, designed for the evaluation of topical and cosmetic hypoallergenic claims and recognized in the industry and accepted by regulatory bodies all around the world, especially in North America and European Union (EU). Why should you do the HRIPT test ? This product safety test is recommended after making a preliminary risk assessment process according to current standards of toxicology. These include individually evaluate product ingredients (toxicological, physico-chemical data, level of purity, impurity rate, type of impurity, stability, quality, bibliographic data …) and to determine the risk taking into account the likely exposure of the target consumer (who ?, how ?, which body parts ?, how long?). The acronym “HRIPT” or “RIPT” means “Human Repeat Insult Patch Test” or “Repeat Insult Patch Test.” It is a clinical study or clinical trial, meaning a scientific experiments being performed on human subjects sometimes called volunteers (or testers of cosmetics and topical products). The HRIPT testing is a method commonly used in the industry to determine the potential for irritation, sensitization and allergic contact of a product. In Europe, the equivalent test implemented by the French agency, ANSM, is called “Test Clinique Final de Sécurite” (TCFS) (or Final Clinical Security Test). It is listed in the safety testing for cosmetics in the European Union (EU) to confirm the absence of delayed skin sensitizer in a formula. What are the advantages to perform an HRIPT ? The first advantage for a manufacturer to perform an RIPT Test (Human Repeat Insult Patch Test) is to establish that the product to be launched is a formula that minimizes the risk of allergenic reactions and/or skin irritation on a target consumer population. Given the growing number of ingredients introduced in topical formulations and the increased sophistication and complexity of formulations, the risk of being exposed to allergens is more frequent. The verification of the irritation potential or the allergenic potential of a product before launching it on the market is a pledge of security. A zero risk formulation does not exist, but the research and development, formulators and marketing teams will feel reassured by a negative result of an internationally recognized clinical study. In addition, the removal of risky ingredients from the product ingredient list (a labeling requirement on all packaging of cosmetics) is certainly appreciated by consumers. Another advantage of the HRIPT test is that it allows supporting a number of interesting product claims such as: “Hypo-allergenic”, “Dermatologist-tested”, “Non-irritating” or “Suitable for sensitive skin” (if tested on self-declared sensitive skin). An added benefit of the HRIPT is that it provides an appreciable “return on investment (ROI)” via a simple and fast (6 weeks) testing method prior to launching a product on the market. The obtained final report written by professionals and signed by a dermatologist is a great advantage when it comes time to demonstrate to the authorities and business partners the validity of the product claims and the product safety. 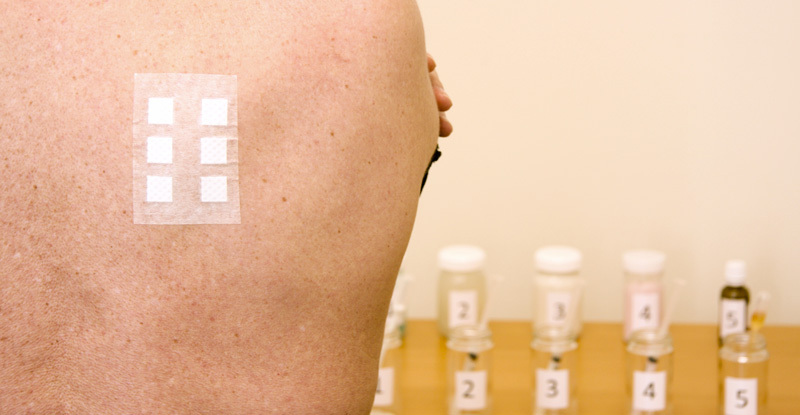 Adapted from the Draize method (sensitization test on animals) and clinical studies published by Kligman and Shelanski in the 80s, the RIPT testing is a skin patch testing usually performed on a panel of 50, 100 or 200 volunteers. It consists of repeated application of patches containing the test product on the back of test subjects, for a period of 6 weeks. Thus, the repeated contact with a potential allergen in the formula (if present) will generate series immunological reactions in the body of the test subject (volunteer) and induce a visible reaction on the application site. The reactions (if any) will be observed, recorded and also evaluated by a dermatologist to confirm or not the allergenicity of the product under consideration and hence ultimately to confirm the product safety. Note that the patch application of the products induces some occlusion and hence promotes the penetration of the product and its ingredients into the epidermis. This patch test is conducted according to the guidelines of Good Clinical Practice (GCP). The patches used can be totally occlusive or semi-occlusive. This RIPT is a skin test that takes place under the supervision of a dermatologist.